MEDICAL COSTS SINCE JUNE 2014: $765.19 PLEASE CONSIDER MAKING A DONATION! 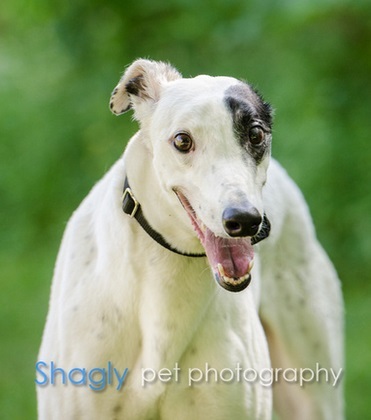 Daphne, aka Dagny Taggart, is a 4-year-old white and black female born on December 30, 2009. Daphne's sire is Flying Penske and her dam is Montana Millie. Daphne has 39 races on record at Greyhound-data.com in Tucson AZ, starting in July 2011 and finishing up in June 2012. She went on to whelp a litter in January 2013, sired by Trent Lee. Daphne is a little reserved at first, but warms up to you quickly. Daphne is being treated for Pannus in both her eyes and gets drops in both eyes twice a day. 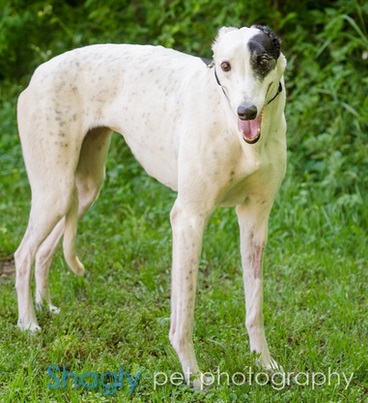 This pretty girl is ready for retirement into a loving forever home! Daphne has passed an initial cat test and is living with cats in a foster home. Daphne broke the outside toe on her right rear foot on Tuesday, June 24, 2014. Her toe is splinted for approximately 5 weeks, and she will have weekly bandage changes. Daphne is being kept very quiet in her foster home. Her splint was removed today, and she must be leash walked for another two weeks. Daphne has been medically cleared and is ready to find her forever home! Daphne is a very sweet, laid back girl. She has impeccable house manners and prefers to sleep and nap on her bed in our room. She will pay us brief visits in the living room but generally retreats back to her bed. She gets along well with the 4 hounds and 2 cats. Once outside, she loves to play with the others. She is a shy girl with a very sweet disposition. 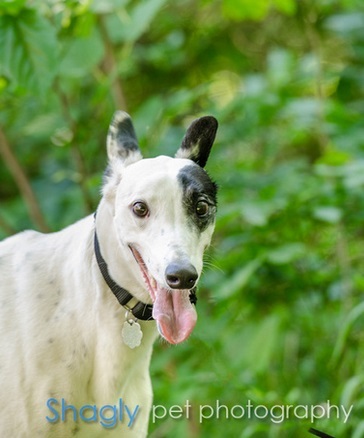 If you are looking for a very quiet, easy companion Daphne could be for you. With her being shy and the fact she loves to play outside with all the other dogs, she may be best suited with a family that has a canine companion for her. We often meet children on our walks and all indications are she would be great with kids. Daphne has Pannus and must have eye drops in both eyes twice a day. She doesn't mind getting the drops and she just knows this happens before breakfast and before dinner. She prefers to eat while laying on her bed. Yes, laying down. She is a bit if of a diva I suppose! She will make some special family very happy.